Is Kazakhstan Holding the World’s Most Boring Election? In other words, the “low-key” election will do nothing to infuse Astana with new ideas or fresh blood. Originally scheduled for early 2017, the early elections fall into a well-established pattern of preemptive elections. Kazakhstan’s previous parliamentary elections, in 2012, were also held early; as were the last two presidential elections. As I commented in January, “The apparent logic behind the early election is to reaffirm the government’s mandate in the face of extreme economic challenges.” With oil prices at decade lows, a general malaise has settled over the economies of Central Asia and Kazakh President Nursultan Nazarbayev may be trying to head off a political crisis to match the economic one. Six political parties have registered candidates, though Nazarbayev’s Nur Otan party is expected to sweep the polls. Nur Otan presently holds 83 seats out of 98 in the Mazhilis, and has by far the largest political apparatus in the country. The two other parties that seated deputies in the outgoing parliament–Ak Zhol and the Communist People’s Party of Kazakhstan (KNPK)–have been broadly referred to as pro-presidential. Joanna Lillis, writing for Eurasianet, called two of the new parties–Birlik (Unity) and Auyl (Village) People’s Patriotic Party–“political minnows” and also pro-presidential. The final party–the Social Democratic Party of Kazakhstan (abbreviated as either OSDP or NSDP)–has been branded as the only real opposition party. The OSCE’s preliminary report foreshadows a repeat verdict. 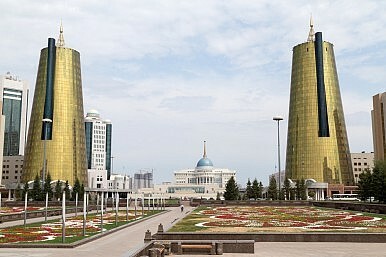 The report says “parties’ campaign platforms differ little in tone and substance and have centered around themes of social stability, long-term plans to tackle the economic crisis, as well as the maintenance of national unity and values; all of which are aligned with the President’s long-term strategies.” Nevermind that Nazarbayev’s previous strategies are in part responsible for Kazakhstan’s current state of affairs. In Kazakhstan, as elsewhere in the region, the technical aspects of democracy–the elections–have been conflated with the actual practice of democracy. That’s not to say the polls are rigged in a traditional sense: Kazakhs will show up and cast their own votes. But the country’s political atmosphere, which embraces a thin sheen of unity over accepting disagreement as a fundamental part of life, holds Kazakhstan back. As the OSCE report notes, there are harsh penalties (up to 20 years in jail) for the vague crime of inciting “social, national and religious discord.” The law is not just on the books, it’s been used numerous times to punish critical voices. Is it an incitement to discord to say that the present political establishment, which has been in place for 25 years, is out of ideas and that Kazakhstan could benefit from political reform as much as it hopes to benefit from economic reforms? For elections branded as poised to “new debates and fresh ideas into the public and politics” the OSCE says the campaign has been “low-key.” To be clear, the election is boring because the results are not just predictable but don’t look likely to matter in terms of political discourse.